After almost 20 years of planning and hard work by many dedicated local people, Axminster has a New Heritage Centre. It will officially be opened on Saturday April 6th by Dr Peter Bradshaw, a direct descendant of Thomas Whitty the first carpet maker in Axminster in 1755. There will literally be celebrations in the streets with a street market in Silver Street and Trinity Square, a brass band and the Town Crier will help announce the opening of the new centre. The Minster bells will also be rung, a tradition which goes back hundreds of years, as when Axminster’s original carpet maker Thomas Whitty finished a major commission it would be paraded through the streets and the bells rang out in celebration. Visitors to the New Heritage Centre will be able to take an interesting trip through time to learn what has made Axminster and the surrounding area what it is today. The new attraction has been designed to appeal to residents and tourist visitors of all ages. Children can enjoy their own trail with dressing up points and hands on activities. The new extended display gallery, with its heritage collection and modern interactive displays, enables you to discover ‘The Story of Axminster’. Learn about its origins in the Bronze and Stone Ages, then as a crossroads on the Roman Fosse Way before developing into a busy agricultural market town. A special focus on the town’s carpet industry includes a 1930s Crabtree Axminster carpet loom, which will occasionally be run for visitors. The town has also attracted all sorts of craftsmen and women, a foundry, two brush factories, both famous for their toothbrushes. A series of precision engineering companies have flourished and examples of some of their innovative products are on display. A small shop and a Tourist Information Point are located in the new reception area, entered via the original carriageway. Located in the centre of the town, all this is fittingly housed in a carpet factory built by the Whitty family, which subsequently served as a court-house and a hospital. Since Easter 2016, during the extensive renovation to the historic building, a small temporary exhibition has been on display to visitors. It proved very popular and trial craft courses, workshops, films and talks have all been well attended. It is hoped that the new centre will have wider appeal and help contribute towards the regeneration of Axminster. 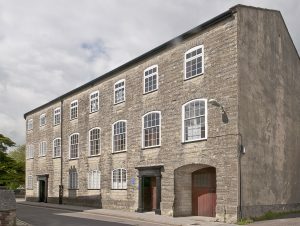 The New Axminster Heritage Centre opens to the public at 10am on April 6th with the official opening ceremony at 12:00. It is open Monday to Friday 10:00 to 16:00 and on Saturdays from 10:00 to 13:00. Entry is free until April 18th so take a look and discover the history of the Axe Valley.